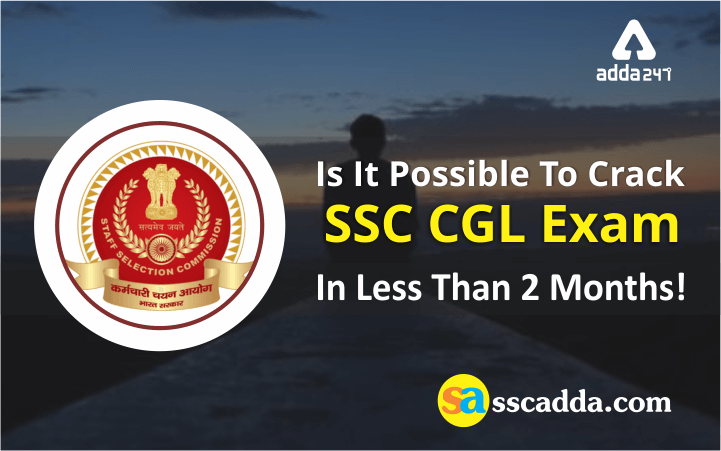 Is It Possible To Crack SSC CGL Exam In Less Than 2 Months! SSC CGL 2018 Exam, which you can call the Exam of the year for the sake of throng it attracts for holding a government job reel under the blow of certain myths spread among its aspirants which to some extent are successful in casting a shadow over the aspirants’ fortitude and expectations with themselves. Such one myth about SSC CGL exam which has turned into the latest fad lays bare that SSC CGL can’t be cracked within one or two months’ preparation. The topic is often put behind when it is desperately needed to bring home on cue. With the SSC CGL 2018 Exam looming large, the myth is much needed to be eradicated before state of affairs jump out of the frying pan into the fire. In retrospection, we can put forward many examples of selected candidates who cracked SSC CGL in a short period of time. Through this post, let’s roll out the key factors which will pump in your much required confidence to cut across the myth which is encumbering your belief of cracking SSC CGL 2018 in less than 2 months. You may come across many aspirants who have been preparing for SSC CGL exam for embarrassing number of years yet struggling hard to crack it in a single attempt. What puts them on the back foot is excessive study hours which are barely qualitative and don’t help in accelerating the pace needed to crack SSC CGL Exam. Undermine the value of time is also one of the reasons behind bearing the brunt of unexpected failure in this crucial exam. While when exam is in the offing, aspirants set about it with vigor and remember what they study more precisely. Doing so, what helps you get by the study hours is the realization of the fact that you were already familiarized with the basics of adequate number of chapters important for the exam which helps in boosting your confidence to deal with the whole syllabus. Instead of puzzling in theory game, the ball now comes in your court to lead you to the attempts of solving questions and grasping the concepts well rooted. Meanwhile you also come to acknowledge about the heavy weightage/ frequent topics to be asked in SSC CGL Exam which immediately pushes you towards the idea of a smart study. This is one leading cause that sets your performance apart from others. For e.g. there are at least one or two sections which don’t bother an SSC CGL aspirant at all. Judging providently, hold on the subject you are not so good at or which bags your attention to the most. The rest of the story ends up with consistency in solving maximum questions, revising the topics, repeating the practice with Daily Quizzes, Mock Tests, Online Test Series and Practice Sets. You can click here to get SSC CGL Study Plan by SSCADDA. A lot many aspirants abruptly hit the reality while taking Mock Tests or the real exam to come to know that while studying they became totally oblivious of the speed skills much required to solve maximum questions in minimum time. This applies to both categories of aspirants who just started their preparation and who have been preparing for a long time. Speed and accuracy is all competitive exams seek for. Even if you have less than 2 months in your pocket to perform extraordinarily in SSC CGL Exam, allot your last 15-20 days to take as many Mock Tests as you can. Stick to the fact that a knowledgeable person can face the failure while one with limited knowledge but appreciable speed skills can get through it easily which implies towards the fact that the time period of 2 months can award you with your selection in SSC CGL 2018 Exam. A well-known but the least applied action involved is a disciplined Time Management. If you have already wasted the whole year, you are more prone to the failure unless you don’t follow a strict Time Management Strategy. If not 100% of your time, at least give 75-85% of your day to learn, practice and solve questions. After all, success is not as lenient as you would be thinking of it. It calls for an adequate amount of effective action.